Chile scrapped their way past a Bolivian side, who can feel pained not to have picked up at least a point, thanks to goals late in each half by Charles Aránguiz and Arturo Vidal, in what was the fifth qualifying match for Brazil 2014. The outcome was exactly what La Roja were looking for after the two comprehensive away defeats previously to Argentina and Uruguay and lifts them into second place behind Argentina in the qualifying standings. 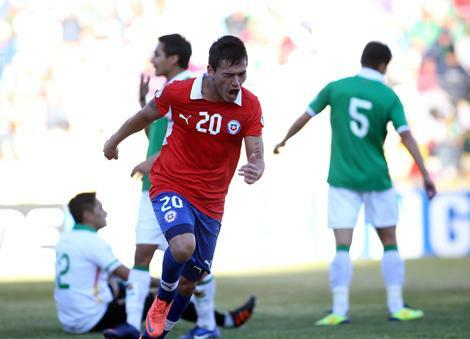 However the means in achieving the victory were not what football fans across the globe have come to expect from Chile. A more clinical opponent in a match officiated by a competent referee could easily have resulted in Chile’s third defeat of the World Cup qualifying, leaving an uphill task for Claudio ‘Bichi’ Borghi’s side. But with Arturo Vidal back in the heart of the midfield La Roja huffed and puffed, scrapped and fought and eventually won through thanks in no part to the determination affirmed by the two goals scored from midfield. 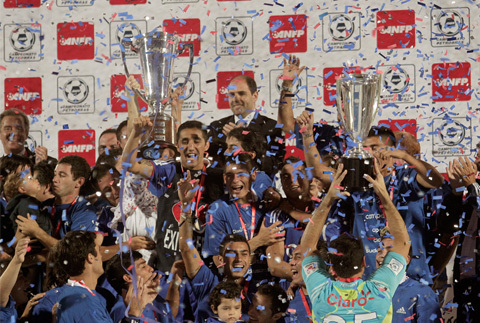 When the clock ticked down to midnight on the 31st December there would have been much reminiscing in Santiago from Azul Azul fans after Universidad de Chile completed an unprecedented Apertura, Clausura and Copa Sudamericana treble with a thumping 3-0 second-leg win over Cobreloa in the Estadio Nacional on the 29th after a goal-less first-leg on Boxing Day. In 2011 Chilean football may have witnessed a team that will go down as one of the best and most successful in the country’s history. A look at how they arrived at three trophies in a year and countless records broken can be read in more detail here. Over the two-legged final La U showed their dominance in the end after what can only be described as an edgy and gritty first-leg in Calama. There was little in the way of goal mouth action. However there was controversy as Cobreloa had a goal controversially ruled out. Nicolás Trecco’s flicked header from a corner was met by Diego Barrios who saw his own header come down off the bar prompting a scramble on the La U line between Jhonny Herrera and Cobreloa defender Sebastián Roco. Herrera managed to trap the ball under his legs but it was knocked free and Barrios bundled the ball behind the line. The referee, Eduardo Gamboa, adjudged Herrera to have had the ball under his control. Attacking and defending. The good teams can do one. The great teams can do both. This present Colo Colo side fall into the former. A valiant effort in a fascinating and high-paced encounter was not enough to edge past a Cobreloa side coached by the gregarious ex-Chile manager Nelson Acosta. Colo Colo had to win by two clear goals due to Cobreloa’s higher placed finish in the league and wasted no time racing into a two goal lead. 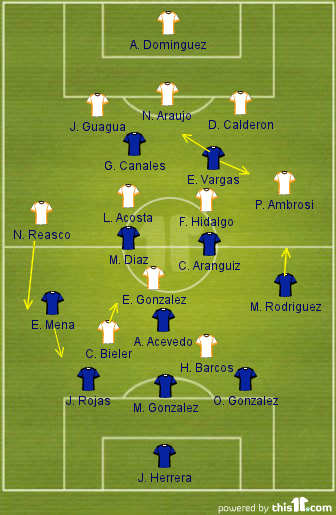 But eventually defensive failings would re-surface even as Cobreloa went down to ten men. Los Albos got off to a great start after 15 minutes when Esteban Paredes brought down a long ball played out of defence while turning Cobreloa defender Cristian Suárez all in one movement before slipping in Muñoz in his second movement. The striker hit into the ground and across goalkeeper Nicolás Peric, setting up a wonderful evening of football. They say that our destiny is written in the stars. And if the Universidad de Chile players looked up to the sky after their resounding 4-0 victory in Brazil against Flamengo they may have just seen the Copa Sudamericana, and the club’s first ever continental trophy. The same could be said about any of the games in this record breaking Copa Sudamericana run, part of the club’s mammoth 35 game unbeaten spell. But the famous result in Brazil had people sit up and take notice, ‘wow’! Now their ‘destiny’ has become reality . . .
Having worked so hard, especially in the defensive phase with a new 3-1-4-2 shape in Ecuador to come away with a crucial 1-0 win in the first-leg of the final La U showed no signs of nerves or apprehension, just steely determination and conviction to make sure there was no let up in the club’s biggest game in their history. 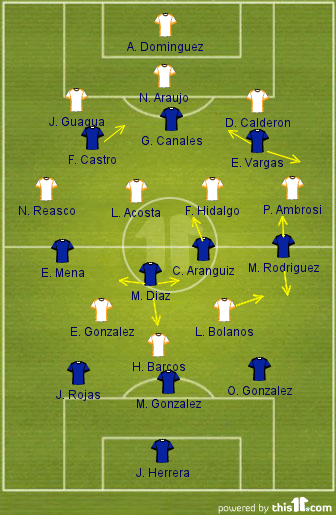 Reverting to their trusted 3-4-3 – Francisco Castro replacing Albert Acevedo – La U were in no mood to sit back defend their lead. They stuck to the principles bestowed in them by Argentine coach Jorge Sampaoli, relentlessly pressing and suffocating the life out of a shell-shocked LDU from kick-off. The Ecuadorians, who do similar to teams at home, had no answer, constantly giving the ball away, panicking, dazed and confused. The fitness of the Chileans was startling; the pint-sized quartet Charles Aránguiz, Marcelo Díaz, Eduardo Vargas, Castro as well as Gustavo Canales and the two wide-men Eugenio Mena and Matías Rodríguez scurried and scuttled around the pitch. Scenting blood they hunted in packs. Ninety minutes. 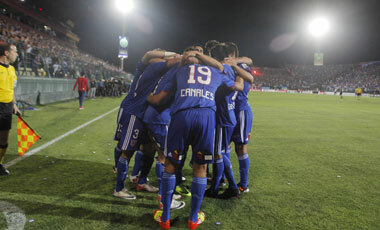 That is all that stands between Universidad de Chile and eternal history; their first ever Continental trophy. Before last night LDU Quito’s home record in this year’s Copa Sudamericana read: played 5, won 5, scored 10, and conceded 1. No team had an answer to Quito’s altitude and LDU’s boundless energy. Now it reads: played 6, won 5, lost 1, scored 10, and conceded 2. This Chilean side continue to astound and amaze; 32 games unbeaten while doing it in style. In the build-up to the game I wrote a piece on the ‘five stars’ of La U’s remarkable run to the final – the first appearance in a Continental final in their history. Jhonny Herrera, José Rojas, Charles Aránguiz, Marcelo Díaz and of course Eduardo Vargas were the chosen ones. But I made a glaring error. I missed out the true ‘star’; Los Azules’ Argentine boss Jorge Sampaoli. A Marcelo Bielsa disciple if there ever was one. La U gave him a chance when no one else would and he has delivered. And then some. With Francisco Castro struggling for full fitness in the build-up to the game Sampaoli went into experimentation mode. 4-4-2, 3-5-2 or 3-4-3 and risk Castro? Tapes would have been watched, notes would have been scribbled and the floor would have taken a pasting from his pacing. Constant pacing. It was settled, 3-5-2. Albert Acevedo was in for Castro. But he didn’t slot in beside Díaz and Aránguiz. He was stationed behind them; 3-1-4-2, matching LDU’s 3-4-1-2(ish) almost man for man in midfield. What may look like a slight difference was a big difference. A crucial difference. Acevedo would have a big part to play in the game; his positioning releasing the two central midfielders in front of him and the wing-backs on either side to be more progressive and play higher up the pitch. Eduardo Vargas, best on the right with the allowance to come inside, played centrally alongside Gustavo Canales. It is said that third time’s a charm. Except for Universidad de Chile, where it’s 5th time lucky. The famous Chilean team had never before competed in a Continental final, sitting in the shadow cast by their rivals Colo Colo’s 1991 Copa Liberatadores and 1992 Recopa Sudamericana successes. However that may be about to change after defeating Brazilian’s Vasco da Gama 2-0 (agg 3-1) in the second leg of the Copa Sudamericana semi-final to their book their place in their first ever Continental final at the 5th time of asking. Goals from Gustavo Canales and Eduardo Vargas either side of half-time eased La U into the final where they will now meet Ecuador’s LDU Quito. There was one change from the first leg for La U, Matías Rodríguez coming in for Gustavo Lorenzetti, giving the team a balance that he provided when he came on in the first half in Brazil. Vasco da Gama 1-1 Universidad de Chile: Jorge Sampaoli forced into an early tactical change as Osvaldo González’s late header hands advantage to Los Azules. Without a defeat in 28 games Universidad de Chile’s visit to Brazilians Vasco da Gama, who sit 2nd in the Brazilian Serie A, was arguably the toughest test this talent-laden La U side has come up against. From early on it was clear that this was not going to be a stroll in the park, akin to the last time they played Brazil, defeating Flamengo 4-0. Vasco, in front of a partisan home crowd, started positively and deservedly went in front. With one first half substitution however Jorge Sampaoli was able to wing the game back in his teams favour as La U went on to control most of the game; themselves deservedly equalising late on. Having made nine changes to the side at the weekend Sampaoli fielded the same side, in an unbalanced 3-4-3, which put three past Arsenal dí Sarandi without reply the week previous. 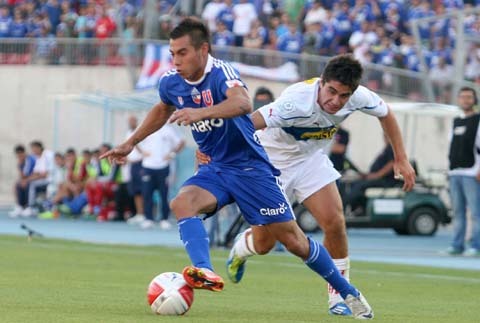 Gustavo Canales continued up front with support from Francisco Castro and Eduardo Vargas. 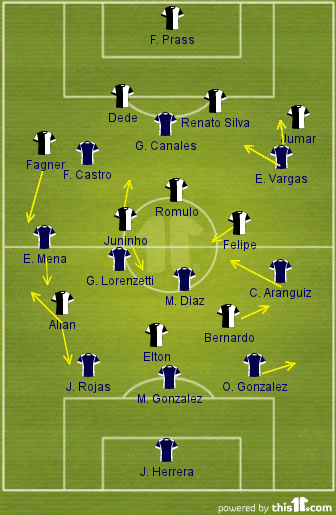 Vasco lined up 4-3-3, Bernardo dropping wide left to torment Osvaldo Gonzalez while Allan and Fágner combined on the right. Ex-Lyon talisman Juninho Pernambucano took up a marauding central position. The home side set their stall out from the beginning, happy to commit men forward; both full-backs showed no hesitation in supporting play. Although that would not last as right-footed left-back Jumar played a more conservative role, wary of the threat of Eduardo Vargas. A possible ploy from Vasco coach Cristóvão Borges playing a right-footer at the left to combat Vargas’ inside runs from a wide position. On the other side however Fágner was forthright in his attacking surges, often popping up in and around the final third. It was a fine battle throughout the game between the right-back, linking with the explosive Allan – comfortable going on the outside or coming into central areas – and La U’s left-sided duo Eugenio Mena and Jose Rojas.